Energy efficiency is changing, with new digital technologies enabling greater control, optimisation and analytics. New policies and new business models will greatly enhance end-use and systems efficiency. 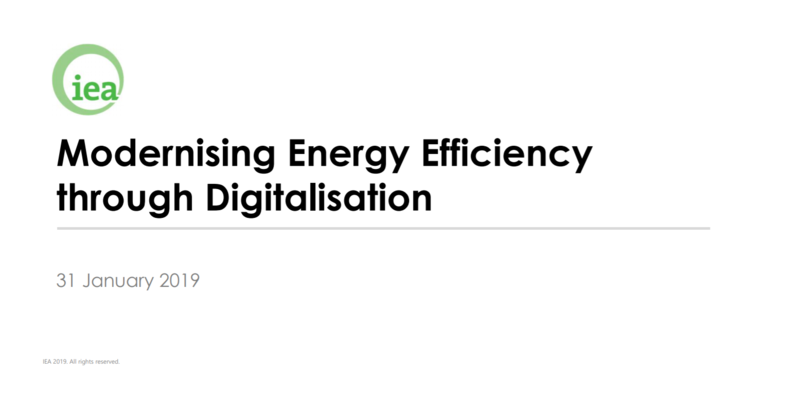 A topic of fast-growing interest to member countries and partners, the IEA has embarked on a cross-agency initiative – Modernising Energy Efficiency through Digitalisation – to explore the potential impacts of digitalisation on energy efficiency and the implications for policy makers. We will develop an analytic framework for assessing impacts, undertake deep dive research on key topics, and build a resource library on the global exchange for energy efficiency. We will also organise a series of thematic events in 2019 to facilitate stakeholder engagement and exchange of best practices. Our first event involved a webinar in which Brian Motherway, Head of the IEA’s Energy Efficiency Division, launched our new initiative and introduces our first guest speaker, David Nemtzow, Director of the U.S. Department of Energy’s Building Technologies Office, who presented on the Grid-interactive Efficient Buildings Program. We are grateful that David was able to help kick-off this webinar series, as his team has been doing great work demonstrating the value energy efficient buildings can play in delivering significant, cost-effective grid resources. This first event was a huge success, drawing nearly 400 participants from 61 countries representing government, research organisations, private industry and large energy users. The Q&A was very lively, with more than 40 questions – most of which we couldn’t get to, so stay tuned for a summary of the questions so that we might continue the discussion. The materials are available here.